What a week it's been - and not likely to slow down anytime soon. But the good news is that it's all good stuff keeping me busy! I'm having so much fun in the studio stamp, stamp, stamping away! My creative genes are working overtime getting ready for my $2 Card Making Night next Thursday AND working on my Convention Swaps AND Baby Shower invitations for a client. Does it make you tired just reading it all? Ha! So, with all that stuff running through your head now, lemme show ya a fun, clean and simple card. I held my Trinity Design Stampers Team Meeting last Saturday and this was my card for our team swap. Oooooh, yeah - it's a SNEAK Peek too! I used my Big Shot Top Note Die - THE tried and true and classic die for our Big Shots - to create this fun easel card. There's a new stamp set coming out in just 6 short days called My Friend. I LOVE this floral/vine solid image in the set. I've made a bunch of samples with it and you'll be seeing it over the coming weeks a lot! I inked the stamp with new Lucky Limeade Classic Ink and then used my Sponge Dauber to add the new Island Indigo Classic Ink around the edges. Kind of like the Rock-n-Roll Technique, but a little more controlled with the Sponge Dauber. The inked image was stamped on a full Top Note cut out of Whisper White cardstock. 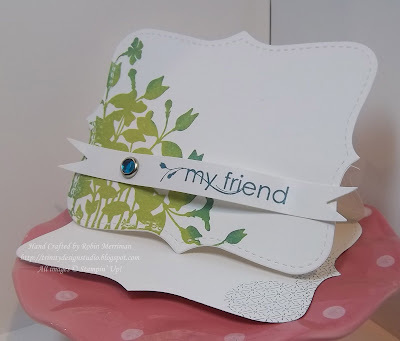 For the greeting, I used a Whisper White scrap and cut out a banner with my Petal Cone Die for the Big Shot. Love that this die allows us to cut banners! Once I cut it out, I stamped the My Friend greeting on it with more Island Indigo Classic Ink. I used my Bone Folder to curl and furl it and then added the Rhinestone Circle Ice Brad to the end. It's attached to the card front with Mini Glue Dots. One final touch - I stamped the little sparkle circle image in Island Indigo on the lower right corner to add a little interest to this sweet note card. I love this card - it's yet another example that something lovely doesn't need to be something complicated! You can place your order at my Online Store anytime, 24/7. Thanks for stopping by today - have a fabulous weekend! so clean & simple; I love this look, as well, I enjoy reading your blog & staring at your samples! I looooove this! Perhaps it is the GoDiva card? Huh? Am I losing my mind or did you change the look of your blog? How did I manage to miss this beautiful card? The Top Note is still my hands down fav! TFS!